For Internal Use, Scroll To Bottom Of Page. If you have sensitive skin Leave on no longer than 3-5 minuets the first time, then use accordingly. Do a skin test first. Make a paste with water and apply a small amount behind your ear. Leave on for 5-10 minuets depending on your skin type, then rinse with warm water. Note: The best method to apply is, start from your chin and apply up and outward making sure to skip the eyes and mouth area. For the nose area, apply the mask solution from the upper part of the nose to lower part following the nose line. Mix to make a paste, then apply to dry, clean face. Leave on for 15 minuets. Rinse off with warm water. Let air dry. Add egg white and comparable amount of fresh pure aloe vera juice, olive oil, apple juice and Pearl Powder in bowl and mix. Dip both hands into your facial mask and apply to skin. • Mix 1 tsp pearl powder and extra virgin olive oil to make a paste. This revitalizes dry, dull skin. • Mix 1 tsp pearl powder with whole milk or cream to make a paste. This is will reduce large skin pores and remove acne. The skin may feel irritated or warm for a few minutes after removing the mask, so let your skin breathe for as long as possible before apply a moisturizer. If you use pearl powder once or twice a week, you will see a beautiful change in your skin in a very short time. • If you spend time in the sun, mix 1 tsp pearl powder in an atomizer containing freshly brewed and strained green tea. Add a drop or two of witch hazel extract and keep the liquid in the refrigerator to preserve its freshness. This spray helps prevent sun damage because of the green tea’s high antioxidant content. • Now it is time to relax. Go ahead, lay down on your back with your face up. Cover your eyes with cucumber or wet cotton balls. Wait 15 minutes to 1/2 hour. Make sure the mask is entirely dry. Once the mask is dry, cup both hands to hold warm water, spread the water evenly over your face. Then gently massage your face. Repeat this several times. Let the air dry your face. Do not use a towel. Mix pearl powder and aloe juice in a cup. Apply mixture on your face and neck. When the mask is dry, apply a second layer. Wash off after 15-20 minutes with warm water. Aloe juice prevents sun damage and improves collagen, the skin's support structure. This mask is remarkable for skin whiting and radiation protection. Mix pearl powder, aloe, and enough white tea to make a paste in a cup. Apply mixture on your face and neck. Leave on for 15 minutes, wash off with warm water. Aloe prevents sun damage and improves collagen, White tea prevents wrinkles and improves skin elasticity. 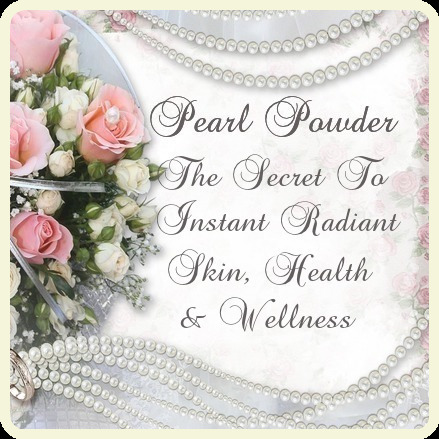 Pearl Powder is abundant in collagen, antioxidents, protein, and amino acids. This recipe is for For Dry, Aging Skin. Banana is one of the most nourishing fruits available because it contains large quantities of magnesium, potassium, iron, zinc, iodine, and vitamins A, B (folic acid), E, and F. Pearl Powder enhances skin elasticity and smoothes skin texture. Butter moistens and Green tea is naturally rich in antioxidants, which helps protect the body from free radicals - naturally occurring particles in the body associated with accelerated aging and an increased risk of major diseases. Mash banana, add fresh cream, strong tea, and Pearl Powder. Mix and apply to clean dry face and neck. Wash off with fresh or rose water after 10-20 minutes. This facial is for Oily and Problem Skin. Cleans and nourishes the skin. Provides acne control through skin anti-inflammatory and hormone balance. In mixer blend Apple, Cucumber and Pear to a sauce-like mixture. Add flour and Pearl Powder, and mix. Apply mixture to your face for 15-20 minutes then wash off with warm water. Mix 1 tsp pearl powder with a vitamins E capsule and enough white vinegar to make paste, then apply mixture to face and neck for about 15 minutes, 2 times a week. • Pearl powder can also be used on its own. Apply it on your face before sleep and remove it the next day. • Pearl powder promotes the regeneration of new cells and makes the skin smooth, fine, elastic and naturally beautiful. • Mix some pearl powder into your foundation powder. This helps the foundation stay on the skin as well as nourishes and whitens it. Or use it as a base before applying foundation. Gently Remove The Toughest Makeup - No Soap - No Chemicals. Most makeup removing products on the market contain chemicals or soap that damage and dry out the skin. Pearl Powder and Olive Oil, gentle and naturally, removes excess dirt, toxins and the toughest makeup, while leaving your skin supple, silky soft, fresh and radiant. Mix 1 tsp pearl powder with 1 Tbsp olive oil. Rub all over your face with a cotton ball, then wash off. Applied on the entire body, improves blood circulation, cleanses the skin, detoxifies and purifies, infuses with minerals and helps restore saggy, loose skin. Add 4 Tbsp Pearl Powder to enough water to make a thin paste, mix well. Apply to the surface of the body, including face and feet. Leave for on 15 minuets. Wash off and dry thoroughly. Fill bath tub half way full with warm water. Add 1 tsp Pearl Powder and 2 Tbsp extra virgin olive oil. Soak for 10 minuets. Dry. For best results apply Silk Peptide Revita Lift Cream formulated with REAL silk to impart slip and glide sheen and suppleness to the skin. The result is healthy, silky, satiny, soft skin. You will feel as if you just spent the day in a mineral rich spa in an exotic paradise. Good for use on all the body's skin. You can enjoy a pearl bath by bathing yourself in warm water added with pearl powder. Your entire body will feel refreshed and energetic after taking the bath. Ultra-Moisturizing, Wildly Luxurious Body Oil. This Body Oil Absorbs Deeply And Will Leave Your Skin Soft, Supple, And Glowing. This formula is pure skin nourishment, gleaming with health. Directions: In small jar or bow, add ingredients and mix well. Apply liberally right after you bathe or shower, while your skin is still damp, then pat dry. They will penetrate quicker when applied this way, and your skin will be more "hydrated, softer and smoother. Pearl Powder makes a great primer/finishing powder and helps reduce pores, fine lines and wrinkles. After applying moisturizer, apply a light dusting of Pearl Powder to your skin and very gently massage into your skin. Mix pearl powder into your powder foundation, which helps the foundation stay on your skin as well nourishes and brightens your skin, or simply use it as a base before applying the foundation. Put small amount of Pearl Powder on tooth brush, brush, rinse and floss. To prevent or treat gum disease always us a good quality electric tooth brush, one like your dentist uses. Pearl stimulates hair follicles to help hair growth, and leaves hair thicker, soft, shiny and naturally healthy. Add 2 tsp to 16 fl oz of shampoo. Mix well. Or, take orally! Add 1/8 tsp to juice, yogurt, puddings, smoothies, etc. once a day. Pearl Powder should never be taken orally without deluting it in liquid, pudding, etc. Applying it to your tounge, it cannot dissolve properly and could cause possible problems. Chinese beauties from the past consumed a morning drink of pearl powder in hot water to keep their complexions beautiful. Mix 1/8 to 1/4 teaspoon pearl powder into your favorite beverage and drink. For healthier juicing, add it to your daily regime. Do this daily and you will notice your skin smoother, softer and more youthful looking. Also, your hair will become thicker and shiner; your nails stronger. • Put a dab of Pearl Powder in yogurt or pudding. • Drink orange juice with a dash of pearl powder. • Put 1/8 to 1/4 teaspoon in water, stir well. Then drink. • Add 1/8 tsp of Pearl Powder to a malt, shake or smoothie. Add 1/8 teaspoon into a high quality milk powder, milk, condensed, or oatmeal everyday. Some Asian mothers give pearl powder to their children before bedtime for its additional calmative effects. Consume 1/8 to 1/4 teaspoon per day after you bathe or excercise when blood circulation is best. Take the same amount at the same time daily to keep yourself young and beautiful. Our Pearl Powder is extremely safe. Safety studies on genuine, finely milled Pearl Powder have shown it to be one hundred percent harmless. It can be taken by anyone throughout a lifetime without side effects. Pearl Powder is available in 1 & 2 oz jars and bulk packages. is for informational purposes only. It does not purport to offer medical advice. Seek your doctors advise for that.